Once the cups were painted and filled, my daughter-in-law helped me punch daisies (love this new punch!) and cut leaves (from the Rose Garden Thinlit Dies) and we pinned them into the foam, creating a tiny bunch of happy flowers! Finally I added a little tag to the handle of the teacup: The Wood Crate Framelits has the PERFECT size tag and the words are from the coordinating Wood Words stamp set: Get them HERE. They are sure to brighten the day of a friend who has done something kind for you! Because friends like you share your love of creating with others by inviting them into your home, Stampin’ Up! demonstrators like me are able to bring the joy of papercrafting to the world! Thank you from the bottom of my heart! It’s our turn to thank you: You may earn MORE Stampin’ Rewards by hosting a party in June (in your home or online)! Pop in tomorrow to get a close-up the adorable gift I made them! Meanwhile, contact me to schedule a party or join my Creative Juice Stamp Club and you’ll have the chance to host one time during the year (club starts in July). ‘Tis the Season for giving thanks, and this fun card is perfect because it can be used for men or women! With just a few products needed, you could create a stack of these to have on hand this month. Click on the picture to download a .pdf tutorial and let the feathers tickle your fancy! How adorably sweet is this “warm” gift of appreciation? 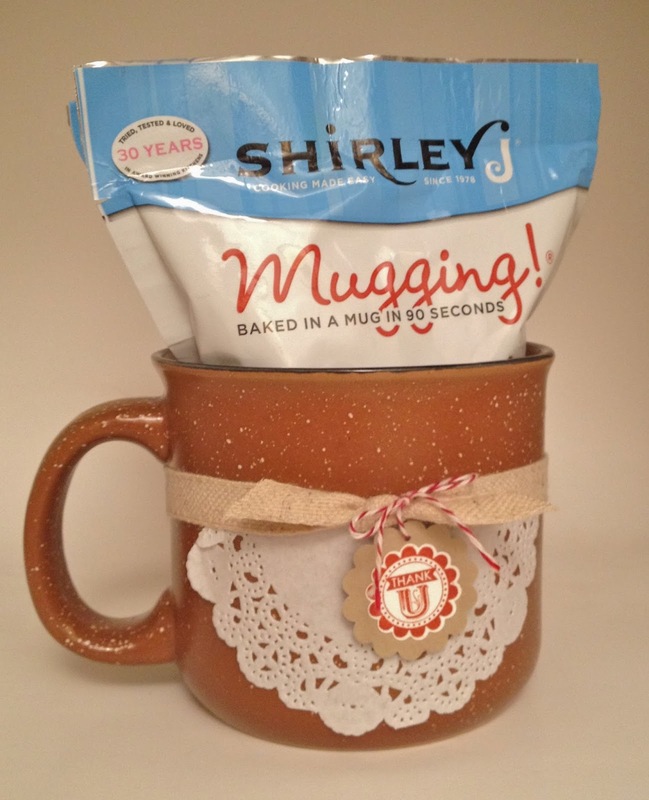 I’ve been looking forward to trying these new “Mugging” mixes from Shirley J and when I saw them at Macey’s today, I had to grab a few, along with this speckled Baked Brown Sugar mug. Add a few Stampin’ Up! supplies to decorate with~Tea Lace Paper Doilies (item 129399), A Round Array stamp set, 7/8″ and 1-1/4″ scallop circle punches (129404 and 127811), 7/16″ Natural Trim (129287), Baker’s Twine and some ink~ and you’ve got a quick gift! All you have to do is add water, stir it up in a mug and microwave for less than 2 minutes! WENDY: You are the winner! Thanks for all your comments and I’m sorry to post the winner so late, but I had to transfer to a new computer 😛 Email me your address and I’ll send a Chocolate Brownie Cake and Pumpkin Spice Bread Mix to you! Then I went shopping and saw the Caramel Apple bite by Russell Stover and if you know me well, I’m an even bigger sucker for CARAMEL than I am for chocolate (and that’s sayin’ something). So I put another handful in my cart and whistled all the way home! 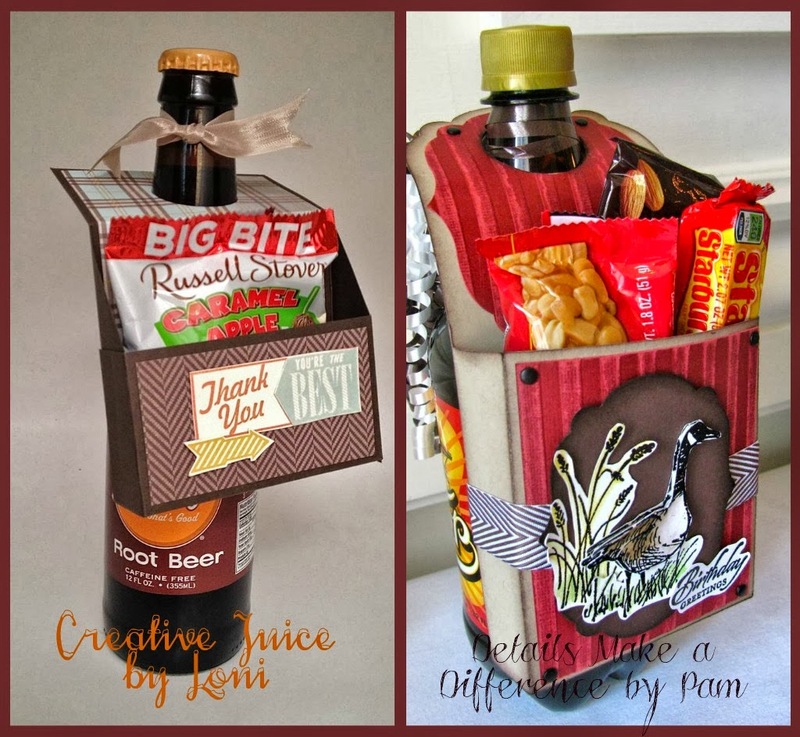 I made a video tutorial for the simple one…I’ll let Cal Ranch know they better stock up on “cute” soda pop 😀 I suspect it tastes as good as it looks, but I don’t know as I’ve been giving all mine away to my Stampin’ Up! hostesses as I demonstrate them! Want me to teach you and your friends? Book a party during October!